After finishing as runner-up last year, England’s Adrian Grant went one better in the 2010 Squash Santiago Open – Santiago City Trophy by winning the $31,175 PSA World Tour title at the Central Area Shopping Center in the city of Santiago de Compostela. The top seeded Londoner faced Egypt’s No2 seed Omar Mosaad – and, for the third time in the event, had to fight back from behind to overcome his opponent. 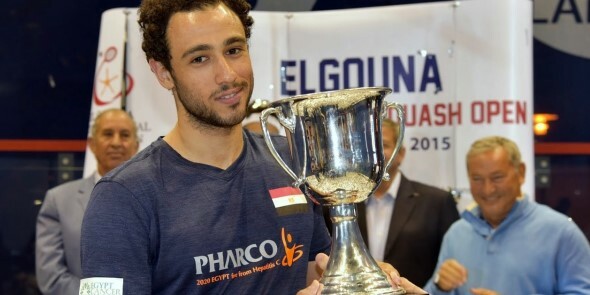 Mosaad, the world No17 from Cairo, took the opening game – but 30-year-old Grant, ranked just a single place higher, battled back to beat the 22-year-old Egyptian 6-11, 11-7, 11-7, 12-10 after 71 minutes. The win takes Grant’s career tally of Tour titles to 17 – one more than England team-mate Nick Matthew, the world No2, and more than any other Englishman on the Tour today.